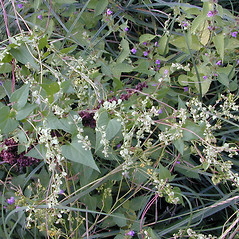 Thicket bindweed is native to east Asia and introduced in New England, where it is known from waste areas, roadsides, back dunes and pond shores in Connecticut, Massachusetts and Rhode Island. However, it is suspected that it occurs in additional New England states. 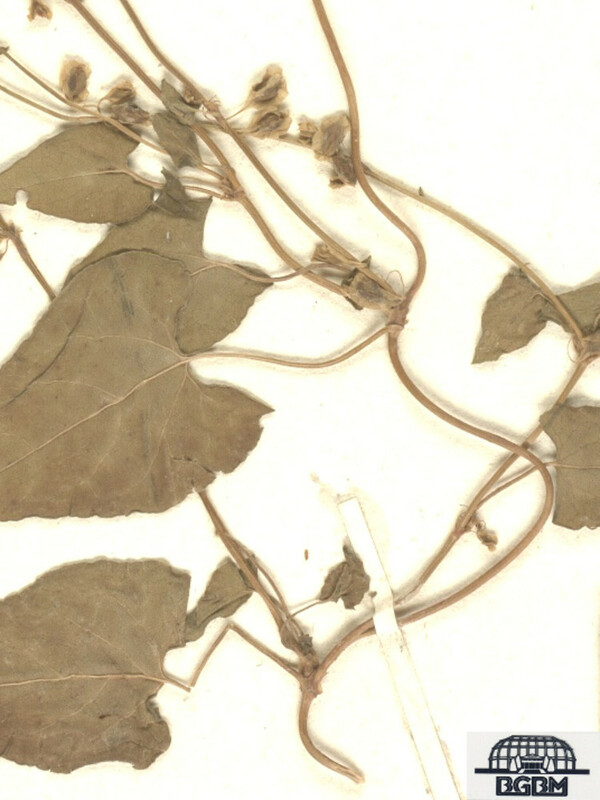 The genus is named for Gabriello Fallopia, a 16th century Italian anatomist. "dumetorum" refers to a climing bramble. This annual, climing herb grows at elevations of over 12,000 feet ( 4500 m) in its native Pakistan. fruiting tepals 3.4–5.1 mm long, with crenate or irregularly jagged and often crisped wings, the wings green to green-white, relatively poorly developed especially near the apex and only 0.25–1 mm wide, and achenes 2.4–2.9 mm long (vs. F. dumatorum, with fruiting tepals mostly 4.2-6.5 mm long, with entire to weakly undulate and plane wings, the wings cream to pale brown or tinged with red, well-developed even near the apex and 1–3 mm wide or rarely poorly developed, and achenes mostly 2.8–3.5 mm long). fruiting tepals mostly 6.5–9.4 mm long, usually gradually narrowed and long-decurrent on the pedicel, achenes mostly 3.7–5.1 mm long, and basal lobes of leaf blades mostly 9–19 mm long when measured parallel to the petiole (vs. F. dumatorum, with fruiting tepals mostly 4.2–6.5 mm long, often abruptly contracted near the base and only shortly decurrent on the pedicel, achenes mostly 2.8–3.5 (–3.7) mm long, and basal lobes of leaf blades mostly 3–8 mm long when measured parallel to petiole). thicket bindweed. 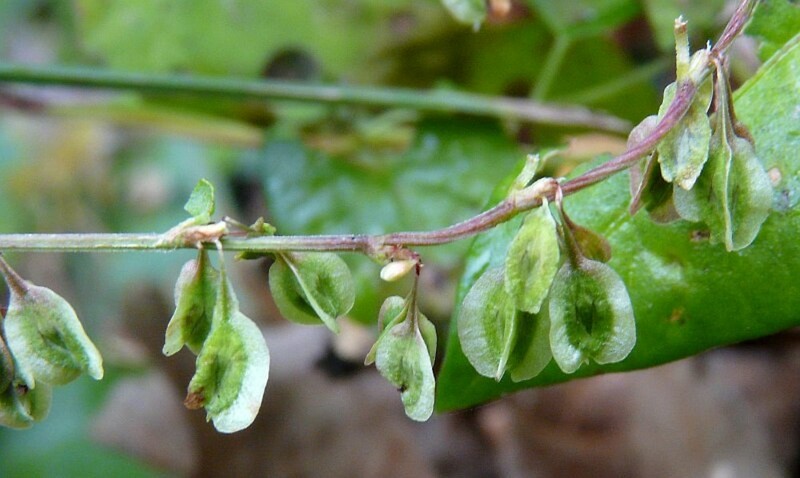 Bilderdykia dumetorum (L.) Dumort. 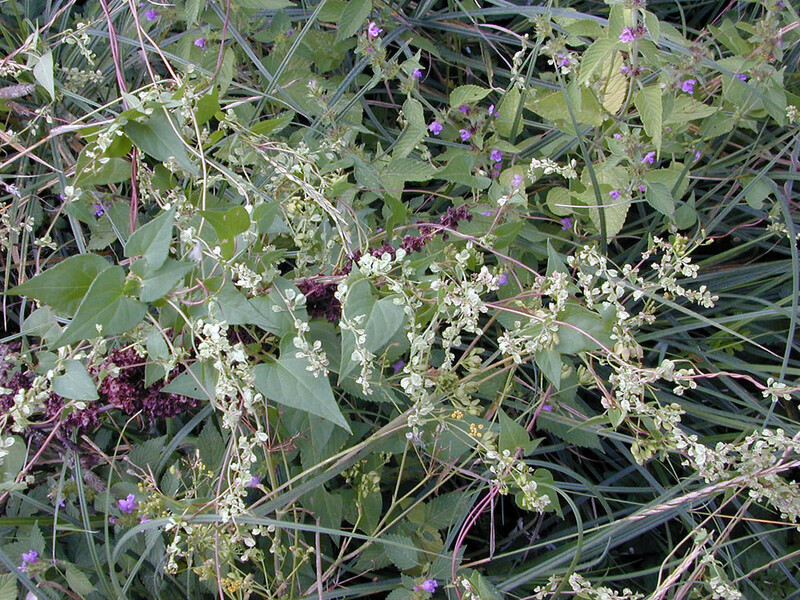 ; Polygonum dumetorum L.; P. scandens L. var. 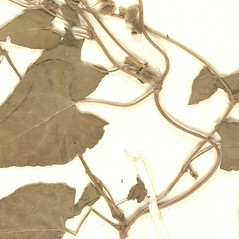 dumetorum (L.) Gleason; Reynoutria scandens (L.) Shinners var. dumetorum (L.) Shinners; Tiniaria dumetorum (L.) Opiz • CT, MA, RI. Waste areas, roadsides, back dunes, pond shores. 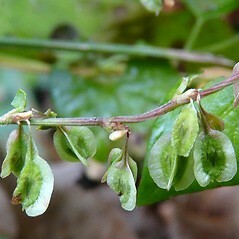 Further study is needed to determine the full distribution of this plant in New England; it may occur in additional states.